My friends don't read my blog. They see it as why read the blog when they can just ask me their beauty questions? When they ask me beauty stuff, I usually respond with, "That's on the blog! You can search for it!" ;) Hehe. Cheeky. Recently my friend asked me about the best drugstore primers to hide pores, I naturally directed her to the blog. But that original post is a couple of years old, so I decided to update it! Today I'm focusing on pores, and next week I'll focus on moisturizing primers. If there's an interest, I can share high-end primers as well! I'll be rating these on 1-5 scale, for effectiveness and lasting power. I'll be reviewing these six primers from the drugstore. This is what they look like out of the tube. There's something about that perfect dollop of the Master Prime--love it. Tradition silicone primer that is a supposed dupe for Porefessional, but on my skin, that is not the case. I like it best over makeup or on bare skin. It's what I use sometimes in my pictures to make my skin look flawless. A little goes a LONG way. It does break me out if I wear it continually, due to silica. There is an oil-free version of this and a Moisture Blur version. 4.5 for me, but most others have given this a 3. The price is ridiculous for a drugstore product. $24.99--This has slightly more product than the Miracle Blur, although the MB has larger packaging. This does a great job of blurring pores and is not as thick as the MB, BUT it separates so quickly. It isn't worth the price for that. I accidentally included this one instead of another one by Milani--it's supposed to go on next week's post--but it is oil-free and does minimize pores. I got this at Target, but Walgreens has started selling Boots No 7 as well. The circled area is what you will see zoomed in over 500% in the collage below, showing the primers in action. Here is each product as worn on my skin with no makeup. This is a super-zoomed in image of my pores and freckles while smiling--the line you see is my nasolabial fold--between my nose and lip, as indicated in the previous picture. Do you use a primer? Which one is your favorite? Got my roots done on Friday! I didn't have long since I had to go back to work, but my magical hair girl Marie made it happen! 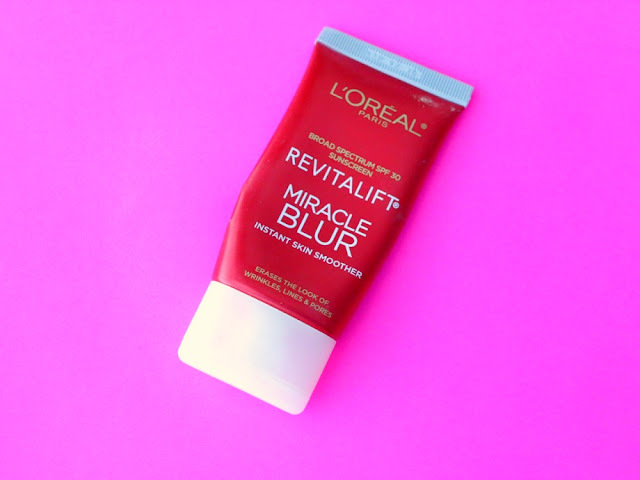 I've always heard great things about the Miracle Blur but the price has steered me away. The Maybelline sounds like the one to try! Thanks for sharing this! I like mattifying primers, I am curious about the Makeup Forever primers, there are so many! I wonder if they are all as good as each other. I direct my friends to my blog too! such a detailed post, I love it! Yes, please do a high end version of this as well. I am on the hunt for a new primer. Glad you got your hair did. Itsn't it such a great feeling! This is extremely helpful in knowing which products work better than others when it comes to priming and hiding pores. I can't believe those loreal products are so pricey to be drugstore. If someones pending that much I think it might be better to just buy a higher end product. To be honest I don't really use primers. I have vowed to change that, but so far haven't gotten around to it. that's awesome - the baby skin has been on my list and glad to know it's not too bad. especially for that price! I've actually never tried a primer before but now this post is making me want to go pick some up from the drugstore! I have to try the baby skin, I have been thinking about it for a while. I don't use a primer, but I need to! I think I will pick up the Boots one on my next Target run! It seems like the L'Oreal ones may be worth it, but they definitely are pricey for drugstore brands! I've been nervous trying these with my weird skin... though I did buy the Elf Primer & it make my face SOOOO SOFT & smooth!! I only use it periodically because I'm afraid I'll turn into a break out mess - though it never has bothered me yet. This is a great comparison, Elle! I recently started using a Too Faced primer that I have been happy with. I have such dry skin, it really helps with hydration. Happy Monday! 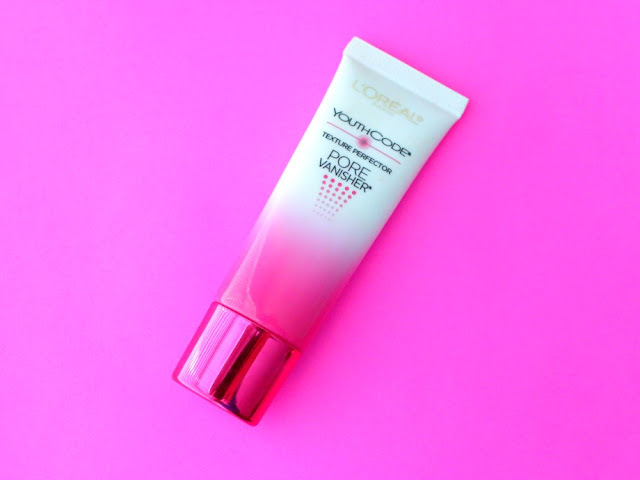 I recently got some Hard Candy primer at the drugstore and absolutely love it - it might be my favourite primer! I only have NYX Angel Veil primer from the drugstore and I love it. I am searching for an illuminating primer from the drugstore, could you do a post on that? I have heard raves about the No. 7. I always use photo finish but would love something less expensive. Great reviews and fun to see the comparisons. Happy Monday and yay to getting your roots done, feels so fresh!! I don't use a primer right now but I think I need to start. I'd like to try the Baby Skin or the Boots no. 7 I think! I swear you can read my mind! 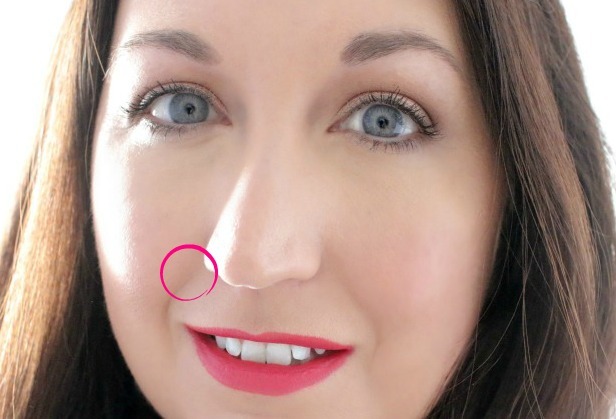 I've been looking for an inexpensive pore filling primer. I love Porefessional, but I don't like the price tag. The NYX pore filler is good as well, but I wanted to try something new. I picked up the elf pore primer and I love it. I really blurred the look of my pores and was on sale for $3 at Target. I've been curious about the L'Oreal ones, but never picked them up because of the price. Now I know to skip on them! I haven't tried many of these. 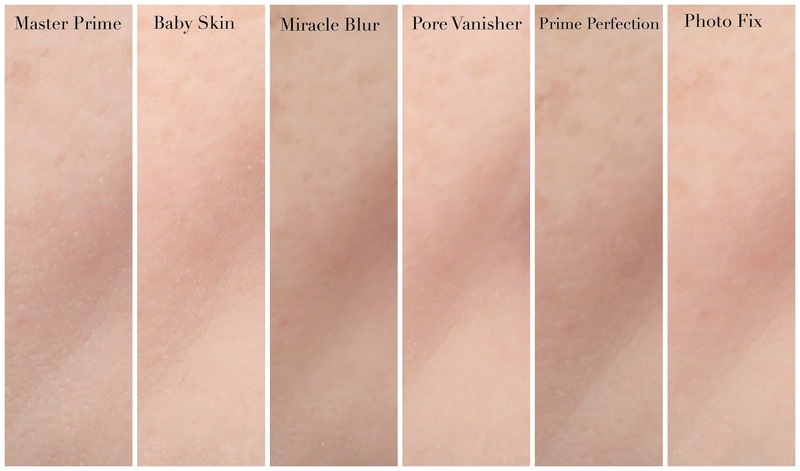 I have tried the Baby Skin which I wasn't a fan of and I currently use the Maybelline Master Prime. I love that primer even though it doesn't hide my pores 100% I feel like it does make my makeup go on smoother and makes my skin look more flawless. I think it does help my skin look matte somewhat but I also think the foundation I use has more to do with that. Great post! 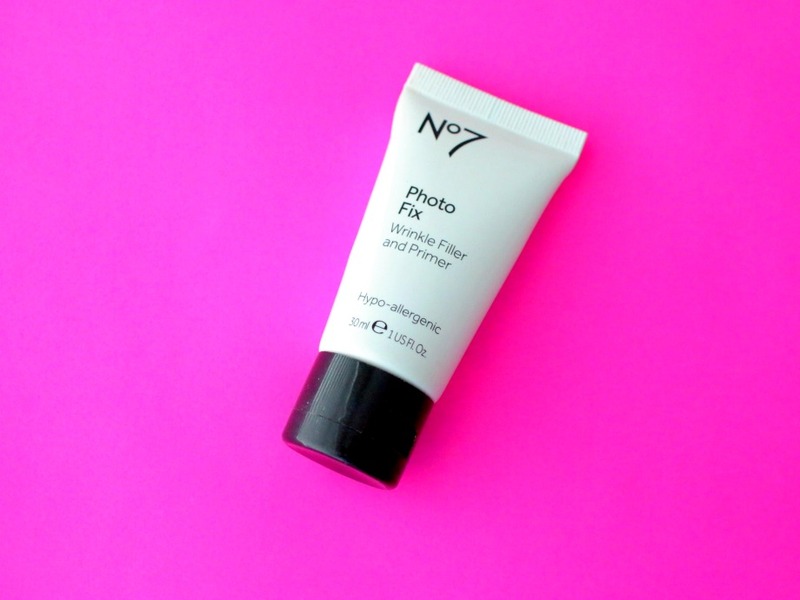 I have really been in love with the No7 products lately, I'll have to look at this one. I do have some larger pores in my T-zone area. Haha I love your response to your friends when they ask for beauty advice! All of those sound like great primers, and I can't wait to see what suggestions you have for some moisturizing primers! This is so helpful! I have been thinking of switching my primer once it's all gone. The close up pictures of your face are super helpful for me because I am looking for pore minimizing. Thank you so much for sharing! Although I don't really do makeup, I always, always love your reviews but you do so much work and really show the product! My hat is off to you! Thank you for this!! I would love the high end version as well! I don't use primer as often as I probably should. Some of them do make me break out. I do have the Master Prime, and I like it. I should use it more! I used smash box primer. I should try these. Maybe one day I'll pick one up. holy moly l'oreal's prices are ridiculous. i have heard good things about the first two but as of right now, i don't use a primer. i want to though, i just get super overwhelmed whenever i look to buy one, haha. i do have the elf one and a rimmel stay matte one, but i don't love or hate either. I always forget to use primer when applying makeup. Good to know about these drugstore brand and than L'Oreal one has a crazy price tag especially if people typically rate it a 3/5. $24.99 for a drugstore primer?!?!?! At that price, you are almost at Smashbox or MUF or whichever luxury brand you prefer! Ouch! I received a Covergirl primer for oily skin in my last Allure box and I am still on the fence on if I like it or not. It seems to be just ok for me. I haven't tried any that you mentioned. I haven't tried any of the ones you listed. I mostly use my YSL and MAC primers. But I'm digging the close-ups you added with the list. Nicely done, Elle! I have primers, since I am a kind of novelty junkie, or was, but in the end I don't use any. I wanted to know about the L'Oreal ones, but now I see they are not for me (due to silica) and Milani is not for sensitive skins, so I will pass. But I loved your review, they were really helpful! I will save some money, I love reviews when I see I shouldn't buy this or that, thank you! I recently started using Maybelline's Instant Pore Eraser and I like it so far! 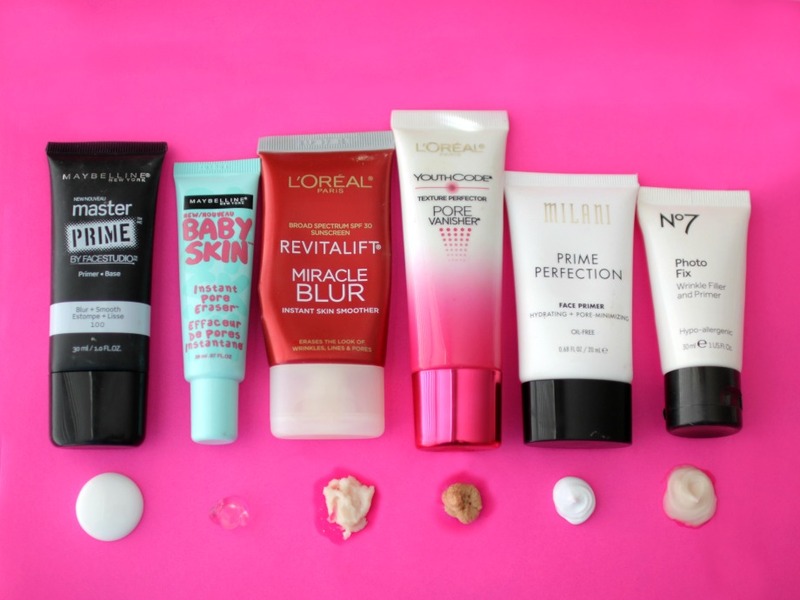 Great list of primers Elle! I love the two Maybelline primers, I use them interchangeably! Love that you went into detail about everything. I always appreciate that. I haven't tried any of these. I swear by Dr. Brandt's Pores No More (but it's so pricey!) I also love the Porefessional. PS - My friends don't read my blog either...but they sure do ask questions all the time. Ugh. Yesss- great review! I need a drugstore primer to add to my arsenal, but I can't believe the $25 price tag of some of these! Thanks for sharing this. I always wonder about drug store primers! I hear you on the friends. I always get calls to tell me what is in whatever recipe. I'm like duh, search my blog! Thanks for reviewing these! I tend to be lazy about primer but makeup definitely lasts longer when I do. I'm currently using Veil Cosmetics Sunset Light which I love. I am usually too lazy to use primer, but this is helpful if I decide to actually put some effort. I haven't tried these yet, although I've heard about the baby soft before. You may have posted about them before, but do you know if the ELF primers are any good? 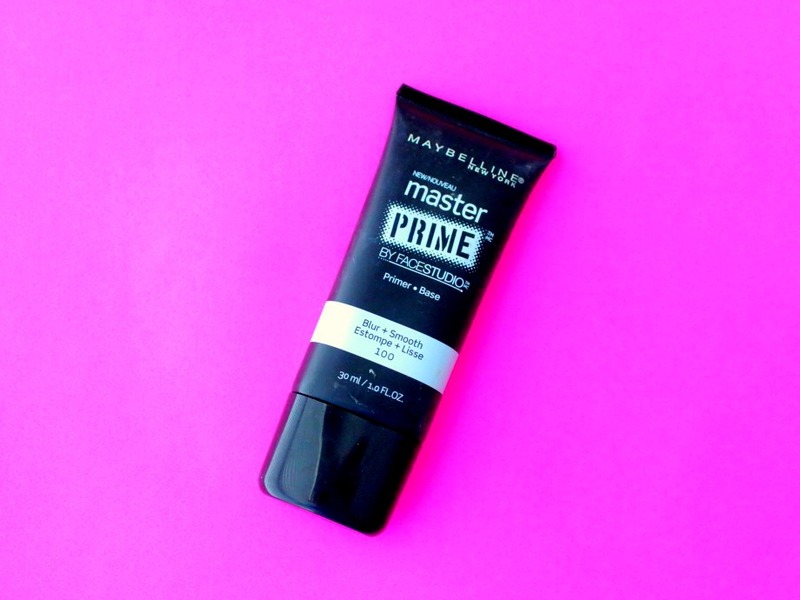 I've used the Master Primer before and I really liked it! Such great reviews, thank you! How do you think they stack up to porefessional from benefit? Awesome post...! I do use a primer - the Laura Mercier Radiant! I love it! And what the... $25 for primer from the drugstore? Highway robbery!! I used to use the Porefessional by Benefit but it made my skin so oily. I haven't really found one yet I liked.